In Windows 10 there is an admin account in for system administration, but this admin account is disabled under Windows 10, if required! Use this admin only if necessary this is an account with full administrator privileges to make windows 10 System changes with full system access and full privileges, the example is also for Microsoft's Windows Web Server 2016/2012 R2 ! 1.) ... Activate the built-in Administrator account with full access! 2.) ... What should I consider in the administrator account with Full Control! 1.) 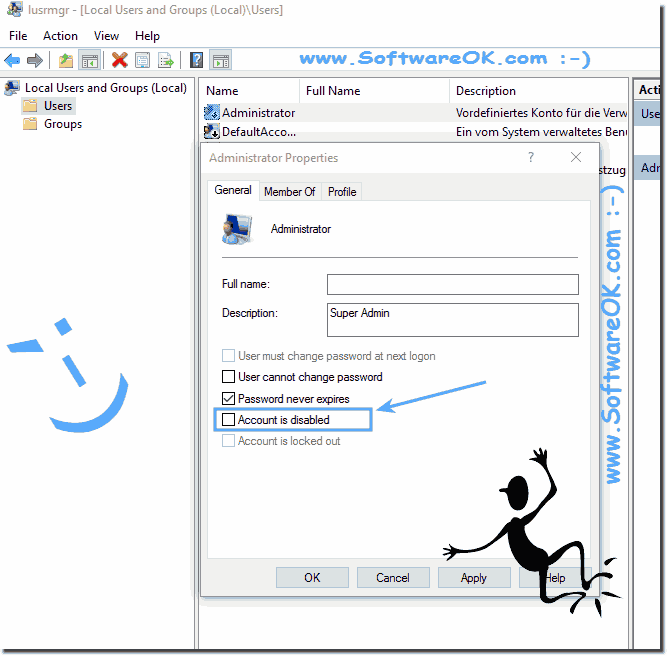 Activate the built-in Administrator account with full access! But it is also possible via Local Users and Groups Manager in Windows 10 but not in Home edition. Now customice, via right-click on the built-in Administrator account and select properties. Now you can activate the built-in admin account on or enable when needed in the "Properties of the administrator"
But ►►► Be careful with the full administrator rights! (Image-1) System administrator Windows 10 with full access! Is a new security component that enables the Windows 10 users to perform common tasks as nonadministrators who are called "standard users" in Windows 10. And as administrators, without having to switch users, log off, or use the Run as administrator command. Local Users and Groups is located in Computer Management, a collection of administrative tools that you can use to manage a single local Windows-10 computer or remote computer. You can use Local Users and Groups to secure and manage Windows 10 groups and user accounts that are stored locally on your PC. You can assign rights and permissions and to a group account or local user account on a particular computer and only that windows 10 computer. In Local Users and Groups on Windows 10, you can limit the ability groups and of users to perform certain actions by assigning rights and permissions to them. A right authorizes an user to perform certain actions on a computer, such as backing up files and folders or shutting down a computer. A permission is a rule that is associated with an Windows 10 object (file, folder driver, app), and it regulates which users can have access to the object and in what manner. (Image-1) Activate Super Admin on Windows-10! Some Windows 10 applications, such as internal line-of-business applications or non-Microsoft products, may require the full administrator access token to perform some of their functions or tasks, but the applications are not identified by the developer or publisher as administrator applications. In this case on Windows 10 , you can use the following procedure to mark an application so that the operating system always prompts for a full administrator access token. 2.) What should I consider in the administrator account with Full Control! Attention! Be careful with the full administrator rights! The computer administrator has full rights. No matter how the user tried. You can use this system ban. Sometimes this is necessary to solve problems, treat and combat malicious files. Therefore you can activate the System Administrator in Windows. It's a legitimate way to get rights to manage and fully manage your computer. ► User-Accounts Windows 10 ► Clean Installation of the Windows 10! ► Defender turn off, Permanently Disable! 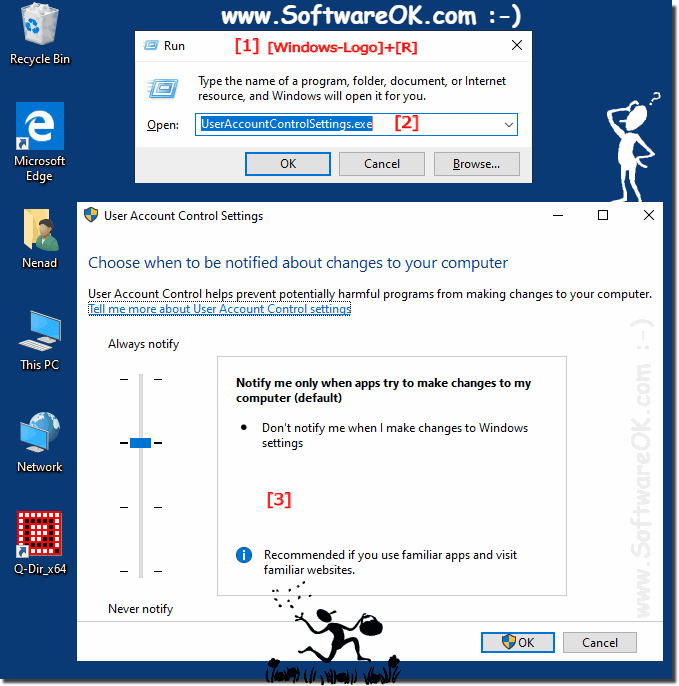 (Image-2) User Account Control Settings in Windows 10! Windows-10 - FAQ-16: System administrator Windows 10, how to activate the full admin account? Supports my graphics card, the new DirectX 12 in Windows 10? The computer name and working group in Windows 10, is it possible to change the name?